I love doing these tips for organising posts so of course couldn't resist doing one about dressing tables. I always find it important to keep my beauty bits tidy because there's nothing worse than wanting that lipstick and having to spend ages rummaging for it. Empty out your dressing table and give it a good clean, it's all about going back to basics. Gather all your beauty bits, jewellery and anything else that you like to store in/on your dressing table, now it's the important part of sorting it all out into what's being kept, sold or thrown. It's important to throw stuff away, not just stuff you don't use or don't necessarily like but stuff that's gone out of date, is broken or is generally no longer fit for use. Whether it's a lipstick or a moisturiser once it's been opened it needs to be used in a matter of months stated on the packet by the little pot icon, if you use out of date makeup you can actually make yourself ill.
Muji acrylic drawers are a beauty lover's best friend when it comes to storing makeup on your dressing table, you can place your favourites products in the drawers, I've even labelled mine to be extra organised. Jewellery can also be stored using Muji but places like Urban Outfitters do amazing options of jewellery displays, whether it's a marble hand like mine or a copper pyramid because we all hate tangled necklaces and odd earrings. Inside your drawers you should also get thinking on how you want things to be stored, Muji's PP Vanity Cases are perfect for sectioning everything especially as they offer different sizes. Ikea also do a few basic options like boxes or inserts. Don't forget Ebay and TkMaxx/Homesense are the ideal places to go for those acrylic beauty organisers, trust me you'll be looking for hours. I love hunting Google and Pinterest for gorgeous dressing tables but sometimes you don't need to look so hard to get inspired. Think of your favourite beauty bloggers and take a look at their blog or even Instagram and I am sure you'll find photos and maybe even a post of their dressing table set up. I love seeing how different people arrange their homes and it's the best way to get inspired to make yours look great. This may be an annoying task but it's important to give everything a little TLC. You have to remember that this is the area you will be putting products on your skin so don't leave old mascara stains in your drawer, bottles covered in over spilled product and make sure you have clean brushes. 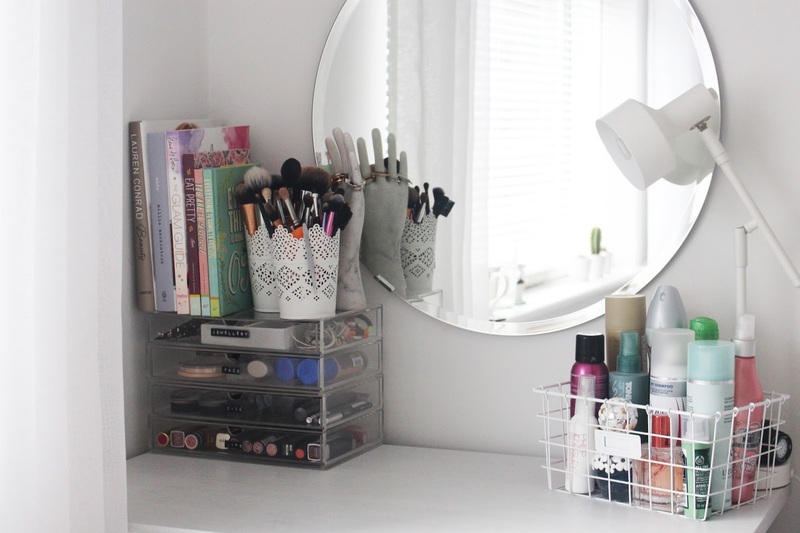 My dressing table isn't exactly awe inspiring but is is very organised, I did write up a makeup and beauty storage/collection post back in September 2014 but for now take a look at this recent vlog where I show you a little update on my collection! 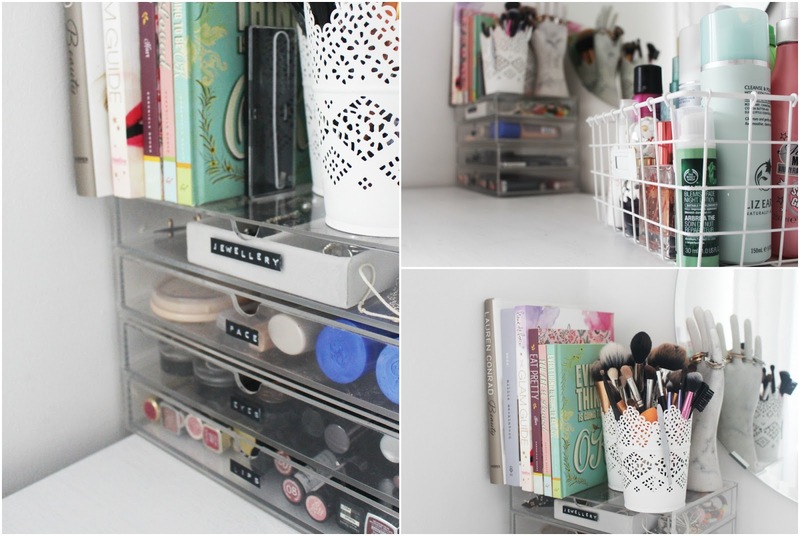 Is your dressing table organised?